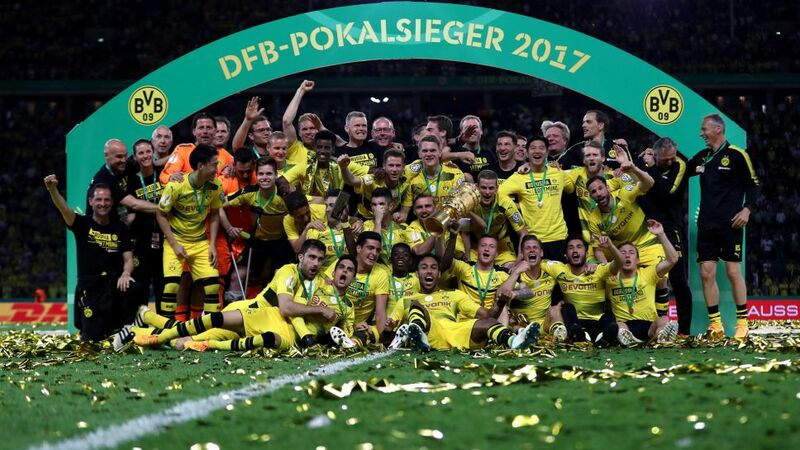 Borussia Dortmund were crowned 2017 DFB Cup champions after beating Eintracht Frankfurt 2-1 in Berlin. Retrace their path to glory below..
After losing three successive DFB Cup finals, Dortmund banished the hoodoo to get their hands on Germany's domestic cup for the fourth time - and first since 2012. Ousmane Dembele struck early for BVB, but Frankfurt levelled before the break through Ante Rebic. Pierre-Emerick Aubameyang scored the winner from the penalty spot 23 minutes from time. Borussia Dortmund came from 2-1 down to beat Bayern Munich in a thrilling last-four encounter at the Allianz Arena. Goals from Javi Martinez and Mats Hummels gave Bayern a half-time lead after Marco Reus had poked BVB ahead, but Pierre-Emerick Aubameyang and Ousmane Dembele struck after the break to seal BVB's place in the final. Schalke had drawn 1-1 in Munich in early February but there was to be no repeat on the first day of March. Robert Lewandowski put Bayern in front after only three minutes and the Polish international set up Thiago Alcantara who headed home 13 minutes later. Lewandowski then all but sealed the holders' place in the last four when he got his 30th goal of the season on 29 minutes. On-loan Bayern defender Holger Badstuber did not enjoy his return to the Allianz Arena - he was sent off with 13 minutes left. Gladbach's strong form under Dieter Hecking continued as second-half penalties from captain Lars Stindl and Raffael helped the visitors get past Hamburg. USA international Bobby Wood got a late consolation goal for the hosts but Gladbach are now one step away from reaching the final for the first time since 1995 - when the Foals won the competition for the third time. The Eagles put aside their disappointing run of form in the Bundesliga to reach the DFB Cup semi-finals thanks to a narrow win at home to second-tier outfit Bielefeld. Danny Blum scored the only goal of the game as early as the sixth minute, and although the visitors pushed for an equaliser they were unable to level the score. Cancer survivor Marco Russ made a late appearance as a substitute for the home team. Ousmane Dembele, Pierre-Emerick Aubameyang and Gonzalo Castro scored from the spot for BVB, while Salomon Kalou, Vladimir Darida and Fabian Lustenberger all missed from 12 yards for Hertha. Dortmund had been reduced to ten men in extra-time when Sokratis had been sent off. In a tight, tense 90 minutes, Kalou had put Hertha ahead in the first half, but Marco Reus equalised for the hosts within three minutes of the restart. Frankfurt booked their place in the last eight, although not without some late drama. Lukas Hradecky saved an injury-time penalty from Salif Sane after the Eagles had been forced to come from behind in the second period. Martin Harnik put Hannover ahead just after the break, before Taleb Tawatha and Haris Seferovic turned the tables on the hosts. Schalke romped into the quarter-finals courtesy of a comfortable win at the Hardtwaldstadion. Goals from Alessandro Schöpf, Daniel Caliguiri and Naldo had the visitors 3-0 up at half-time, and although Andrew Wooten cut the deficit in the 64th minute, Markus Weinzierl's side had the last laugh when Yevhen Konoplyanka scored with 20 minutes left. USMNT striker Bobby Wood was inspirational in HSV's victory, having a hand in the build-up to Gideon Jung's opener in the fifth minute, before scoring an excellent goal himself in the second half. Douglas Costa's deflected strike was enough for the holders against Bundesliga rivals and 2014/15 winners VfL Wolfsburg. First-half goals from Oscar Wendt and Thorgan Hazard fired Gladbach through to the quarter-finals at the expense of second-tier Fürth, who had Adam Pinter sent off in the 18th minute. Leverkusen twice went ahead, but were twice pegged back, before Lotte prevailed in a dramatic penalty shoot-out. Freiburg came from 3-1 down in normal time to force an extra half-hour, but after no further goals were scored, the second-tier outfit held their nerve from the spot. A first-half brace from Bobby Wood helped Hamburg into the last 16. The two top-flight outfits could not be separated in normal or in extra time, but the hosts kept their cool from the spot to secure a place in the third round. The capital-city side easily prevailed thanks to goals from Mitchell Weiser and Valentin Stocker. Gladbach avoided a potential banana skin by beating high-flying second-tier side Stuttgart thanks to goals from Fabian Johnson and Lars Stindl. Darmstadt slipped up at fourth-division Walldorf and exited the DFB Cup at the second hurdle. Mario Gomez's goal early in the second-half ensured that the 2015 DFB Cup winners progressed to the last 16. Leading 1-0 in the closing stages, Mainz threw away their advantage in the final ten minutes and were knocked out by second-tier Fürth. Leading 3-0 at half-time, the Royal-Blues survived a second-half scare to book their ticket to the last 16. Anthony Modeste scored in extra time to knock his former club out of the DFB Cup and send the Billy-Goats into the next round. Philipp Lahm, Julian Green and David Alaba were on target for the holders, who eased past Bavarian rivals Augsburg. BVB were given an almighty scare by the second-tier Berlin side, but Roman Weidenfeller's penalty heroics ensured that Die Schwarz-Gelben would progress. Borussia Dortmund attacker Shinji Kagawa scored a brace and newcomer Andre Schürrle got his first goal for the club as BVB eased into the second round away to Trier. Thomas Tuchel's charges started brightly, and once Kagawa had opened the scoring in the eighth minute the outcome of the game was never in doubt. New Hamburg signing Alen Halilovic enjoyed a dream debut for the Red Shorts, scoring the only goal of the game in the 70th minute, just seven minutes after entering the pitch. The Bundesliga side dominated the vast majority of the encounter but could not put away their chances to give themselves greater breathing room. Eintracht Frankfurt needed a penalty shoot-out to get past 1. FC Magdeburg, after Branimir Hrgota's early goal was cancelled out late on. Makoto Hasebe and Omar Mascarell missed their spot-kicks too, but fortunately for the Eagles, their hosts were even less accurate in the MDCC-Arena. 1. FSV Mainz 05 needed a penalty shoot-out to beat SpVgg Unterhaching after a remarkable late comeback from the Bavarians forced extra-time. Mainz appeared to be heading into the second round when goals from Jhon Cordoba (21'), Fabian Frey (64') and Yunus Malli (88') gave them a 3-1 lead, but their hosts scored two late goals to level. Giulio Donati was sent off in extra-time, but Mainz made no more mistakes with two penalty misses for Unterhaching seeing them beaten. Bayer 04 Leverkusen made hard work of booking their place in the second round with Javier 'Chicharito' Hernandez and Karim Bellarabi scoring in a 2-1 win at SC Hauenstein. The fifth-division hosts showed no sign of the back-to-back defeats which had blighted the start to their league season as they pushed Roger Schmidt's men all the way. SV Darmstadt 98 were unable to take too much joy out of their 7-0 win over Bremer SV since they also lost Aytac Sulu to what appeared to be a serious injury. Antonio Colak (18', 45', 58') netted a hat-trick with Marcel Heller (40'), Jerome Gondorf (56') and Sven Schipplock (87') providing the other goals for Norbert Meier's men, with an own goal rounding things off. Bremen got to within touching distance of the final last year, but their DFB Cup adventure ended in round one this time with Zlatko Junozuvic's goal not enough to prevent Viktor Skripnik's men from going down to a 2-1 defeat at Sportfreunde Lotte. Hertha Berlin needed a penalty shoot-out to get past Jahn Regensburg, although they were just minutes away from elimination in normal time before Mitchell Weiser brought them level. Salomon Kalou kept his cool to convert the decisive spot-kick after Rune Jarstein saved Regensburg's first sudden-death effort. 120 minutes were not enough to separate Aue and Ingolstadt, and 14 penalties could not separate the two teams either. In the end, it was Tobias Levels who converted the decisive penalty to put the Bavarians through on a dramatic night. FC Bayern München are through to the next round of the DFB Cup after a convincing 5-0 victory against Regionalliga side Carl Zeiss Jena. Robert Lewandowski (3’, 34’, and 43’ minute) scored a hat-trick in the first half to put the reigning champions 3-0 up after 45 minutes. Arturo Vidal (72’), and Mats Hummels (77’) scored the other two goals. Over in Ravensburg, FC Augsburg cruised into the next round with a 2-0 victory against fifth-tier FV Ravensburg. Ja-Cheol Koo put Augsburg ahead just inside the half-hour, and Raul Bobadilla removed any doubt as to who would advance, making it 2-0 with a little over 20 minutes left. In the far north of Germany, Borussia Mönchengladbach had their work cut out against Regionalliga outfit SV Drochtersen/Assel. The Champions League participants only progressed to the second round of the DFB Cup thanks to Julian Korb's second-half strike. Gladbach's great rivals 1. FC Köln had no such trouble, making light work of sixth-division BFC Preussen. The goals came from Konstantin Rausch, Anthony Modeste, Dominic Maroh, Marcel Risse, Artjoms Rudnevs and Yuya Osaka, who weighed in with a brace. Markus Weinzierl got off to a winning start in his first competitive outing as coach of FC Schalke 04. The Royal Blues sauntered into the next round thanks to goals from Dennis Aogo, new signing Breel Embolo, a 35-yard screamer from Johannes Geis and Klaas-Jan Huntelaar. Newly-promoted SC Freiburg warmed up nicely for their return to the top flight with a comfortable victory in Babalsberg. Vincenzo Grifo put the visitors ahead from the spot after just 20 minutes and that lead was never seriously threatened. Grifo grabbed a second goal, sandwiched in between strikes from Janik Haberer and Florian Niederlechner. Bundesliga new boys RB Leipzig fell at the first hurdle after a real cup fight in their tie at neighbours Dynamo Dresden. Ralf Hasenhüttl's side looked to be cruising at half-time after racing into a 2-0 lead thanks to goals from Marcel Sabitzer and Domink Kaiser. But the home side hit back after the break to level the scores and take the game into extra-time. There were no further goals and the match went down to penalties. The Bundesliga 2 outfit held their nerve from the spot, converting all their penalties. VfL Wolfsburg are through to the next round after defeating promoted Bundesliga 2 side FSV Frankfurt 2-1. Frankfurt's Steffen Schäfer gave Wolfsburg the lead with an own goal in the fifth minute, before Dutch striker Bas Dost made it 2-0 to Wolfsburg 11 minutes later. Frankfurt made it 2-1 shortly after half-time, but a confident performance by the Wolves never left any doubt, and despite the narrow scoreline, Wolfsburg were always in charge.